Are you sick of each other yet? No, we quite enjoy each other’s company. Are you tired of living out of a backpack yet? Mike: At times. It’s something where even though we have limited clothes, you still end up choosing the first available outfit and not even utilizing everything in the bag. Tara: Surprisingly not. It’s nice not having a lot to choose from. I think I was the only person at my high school who liked wearing a uniform. One less thing to have to waste my time on. 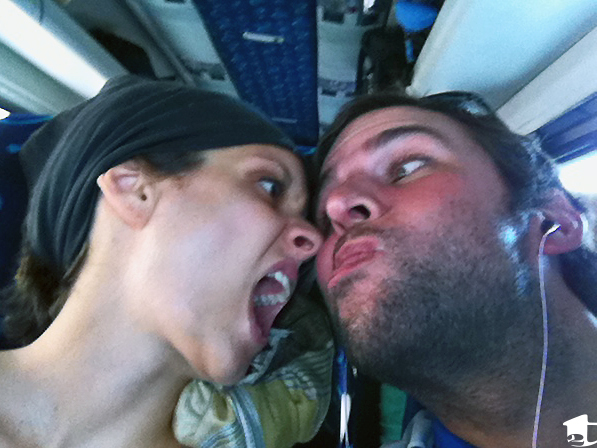 We love each other, really. What language other than English do you suggest would be most helpful to study or learn on an around the world trip? It really depends on where you’re headed, but English does seem to be the common language thanks to the Brits and the missionaries. However, it would probably be helpful to know a romance language, like Spanish, since knowing one will help you understand the others. What is a thing (food, gadget, thgamabobber, whatever) you miss most about the US when you are traveling? Mike: Fast, reliable Internet. While we’ve been able to get online, 90% of the time we’re unsure whether we’ll have Internet access and what the connection speed will be. Tara: Working out. Ok, that might sound corny, but I was a part-time fitness instructor and loved it. Using the gym really cleared my mind and made me feel energized. My only option now is running outdoors and not every city we go to is runner friendly. What apps, programs, phone cards, etc. do you use to communicate with your friends and family? Which ones work best and how do they work? Do you need WiFi for them? We use Skype to stay in touch with family and friends. Whenever we arrive in a country, we buy a SIM card so we are able to use our international phone locally. We don’t travel with guidebooks; we use an iPhone app called Triposo that lets you locally download mini-guides. How are your clothes and backpacks holding up? Surprisingly well. Our REI backpacks are amazingly well made and have given us no problems. It’s Tara’s second multi-month trip with her pack, too. Certain pieces of clothing have been tossed along the way, but after about five months on the road, most of them have held up just fine. And we don’t smell yet! (We think.) Occasionally, we have access to washing machines, but we mostly hand wash our clothes in basins. Does x country sell the same brands as in the States? We’ve seen the same products in every country we have been to. From Coke to Kotex, we have found everything we’ve needed. 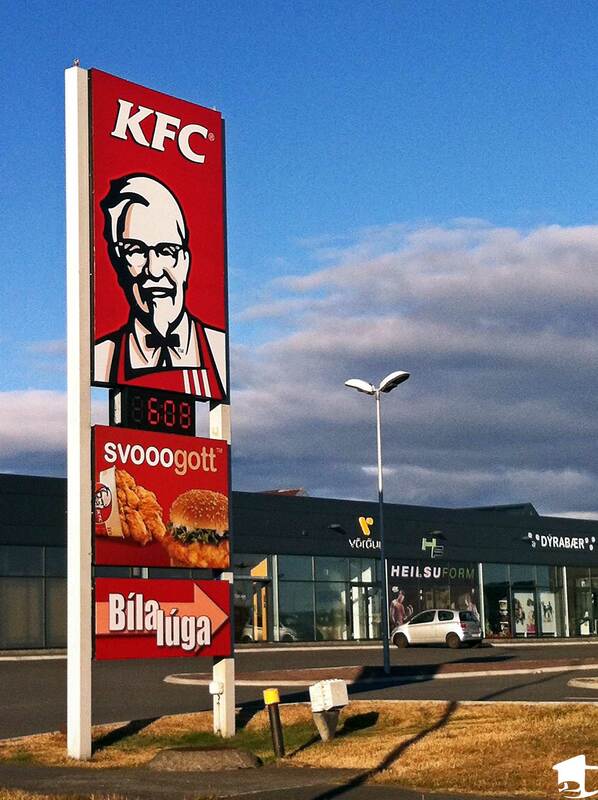 The only country that has no McDonald’s is Iceland, but KFC is ubiquitous. The world loves its fried chicken. How does Couchsurfing work, and what has it been like? Think of it like Facebook where everyone has a profile (except this time profiles are pretty detailed), and people you have CS’ed with leave a reference on your profile so others can get a better sense of who you are. When you’re traveling, you search for people in whatever location and send a request to those you would like to meet or stay with. They can accept or reject you. When we stay with people, we always offer to cook a meal or two (and we buy the groceries). If we find cool items during our travels, we pick up a couple so we can give them as gifts to future hosts. It pretty much always feels like we’re staying with distant relatives or foreign friends. Everyone is very open and welcoming, using the “my house is your house” motto. About half our hosts have given us keys to their home so we can come and go as we please. Others have cooked for us, offered use of their car, driven us around town, taken us sightseeing and introduced us to friends. Couchsurfing has given us the opportunity to interact with locals and therefore better understand the history and culture of the cities and countries we’ve visited. It’s enriched our experience more than we can put into words. And most importantly, it’s renewed our faith in the kindness of people. Is there anything you forgot to do/didn’t think of before setting off that you would make sure to do next time or advise others to do if traveling the world in the future? We were pretty damn thorough. The only piece of advice would be to start selling/donating/throwing away your possessions as soon as possible. The day we left DC, our apartment still had stuff in it. Maintenance was excited for all the free stuff, but we would’ve liked to have more time to dole out items to charities and whatnot. Mike: Personally, I would have listened to my genius wife and conducted a packing test earlier. Including: setting aside everything I want to bring, packing it up and walking around the block with my backpack. This way I could have felt the weight of my bag and known whether I needed to lose some items. Because I didn’t do that, going to NYC before flying out of the States was a blessing. I was able to shed some pounds and flat mail a few things to my parents. Quick example: We were going to bring a telephoto and wide angle lens for our camera. But wow did they add weight! It’s unfortunate because they would have been great for our upcoming safari, but carrying three lenses for a year is just impractical since we’re not traveling as professional photographers. How do you manage to just chill out? Whenever I go on trips I go into crazy “I have to see everything” mode, which works when I’m going home in a week. 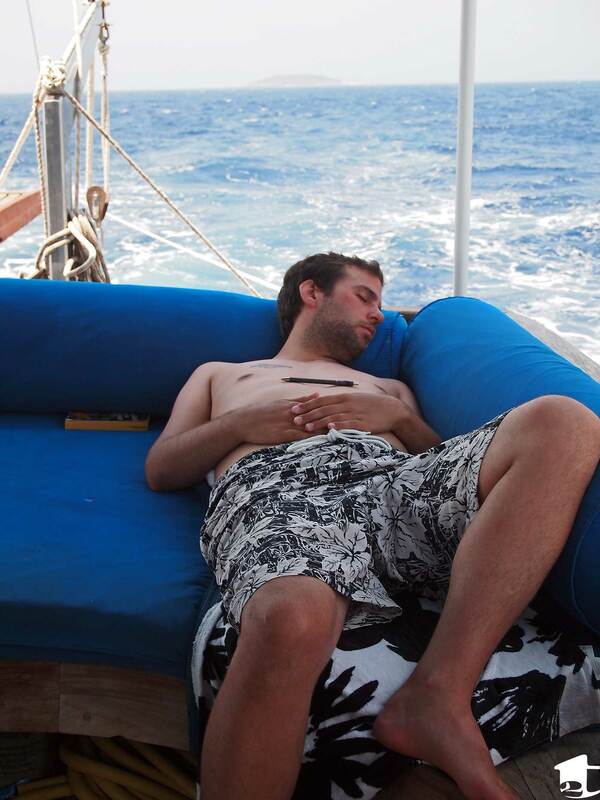 But how do you talk yourself into resting and doing nothing when you’re in Egypt? It was very difficult for Tara in the beginning. She was Mrs. Go Go GO! The most important thing we learned is to remind ourselves that this is our life now. There must be a balance or we will feel burnt out. We’re not traveling super slow, but we have slowed down compared to our first few months. Now we stay in each city for about a week, allowing us to alternate days of relaxation and exploration. It also helps us enjoy each city more. Sometimes we force ourselves to relax. How do you keep yourself going on? At some point you must be sooo exhausted! You’d think. But since we no longer work, this trip feels like retirement for us. We get to wake up and plan each day according to our desires. Sleep in and go wine tasting in the afternoon? Sure. Wake up early to go cage diving? Yep. Plop on a beach and do nothing? Ok. Spend the day exploring the city center? Let’s go! We tell ourselves we have all the time in the world. If we didn’t feel that way, each day would be rushed. Maybe we are missing out on some things by not utilizing every day for sightseeing, but that’s not what our trip is about. We want to take things in slowly, as they come. If we don’t walk across that city’s famous bridge, no matter. We’re learning to be travelers and not tourists. To us, that means slowing down in order to make each city feel like our home. Were any of the countries you’ve been to underwhelming? That’s an interesting question. Wouldn’t it be rude of us to say yes? “Hey you, you’re country is lame!” Anyway, as you can tell, the answer is no. Some countries were more interesting to us than others for various reasons, but we left each country with some kind of take-away – whether it was new information or new friends, the experience of interacting with a different culture, learning parts of a new (for us) language, and stepping further outside our comfort zone. Each country has helped us in some way, and we’re only thankful for that. I want to know about the budgeting planning process. 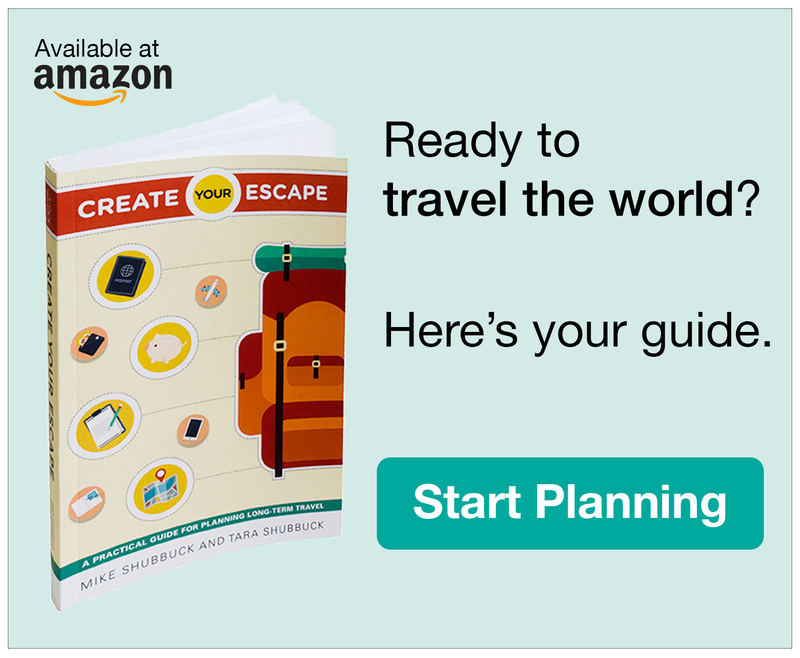 Planning for a year in so many different countries must have been daunting! Ahhh the budget. Tara did that, so if we run out of money in a month, blame her. This trip required our life savings. Literally. You know how people save all their lives and then use that money to buy a house? Well, the world is now our house. Aside from our savings, we moved into a smaller apartment so we could pay less per month in rent. We already didn’t own a car, but we also tried to cut back on public transportation as much as possible (our feet logged a lot of miles the past couple years!). We both earned promotions (and thus raises) and Tara added another fitness class to her teaching schedule. Then we went on a spending diet, not allowing ourselves to buy new clothes and housewares, and Tara was forced to limit her happy hour outings. Lucky for us, there are plenty of free things to do in DC, though we were too busy planning for our wedding and this trip to put much effort into our social lives. But it was all worth it, and we’d do it again in a heartbeat. Mike: This is such a tough question since I loved Croatia, specifically Zagreb, but I would no means say it was my favorite place. 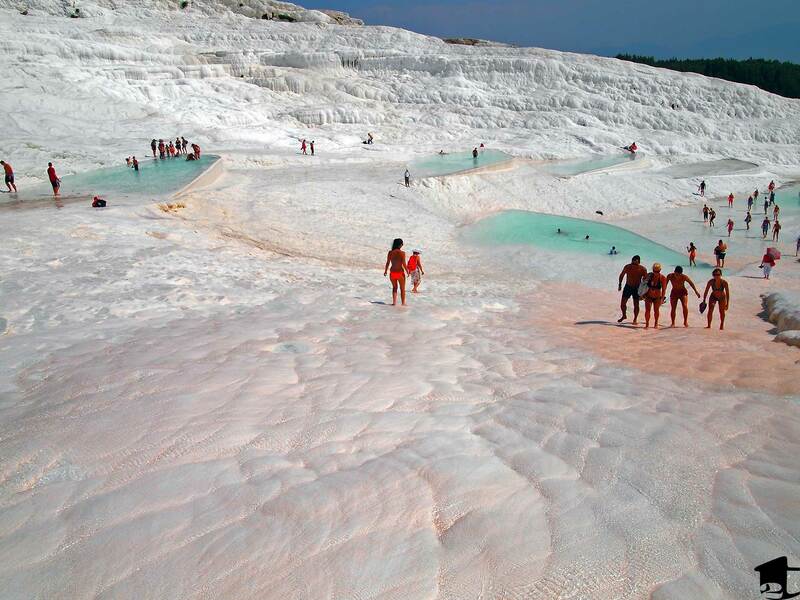 But if I had to narrow it down to one tourist location, it would have to say Pamukkale, Turkey. That place was unreal and one of the few locations we wish we could have spent more time at. Tara: Gahhhh that’s such a tough question to answer. I’ve fallen in love with so many locations on our trip, and all for different reasons. If I have to choose, I’ll say Iceland since as a whole it was pretty awesome. It was our first stop – and therefore the most anticipated – and it didn’t let me down. From the kind people to the incredible landscape, Iceland definitely left me in awe. I just wish everything wasn’t so expensive. But it’s an island, so what can you do? Did you forget to submit a question? Wondering anything new? We’ll do another round of answers as soon as we get enough questions. Submit whenever you’d like! I like it when you say “Maybe we are missing out on some things by not utilizing every day for sightseeing, but that’s not what our trip is about.” I feel the same way. We are on our second RTW, with no plans of returning this time. We do not see everything in the guidebook, and in some cities we see nothing on that list. But, we search out good food, good people, walk around the city, and get a feel for it. To me, that is much more interesting. Other people may look at it as though I am “wasting” my opportunity. 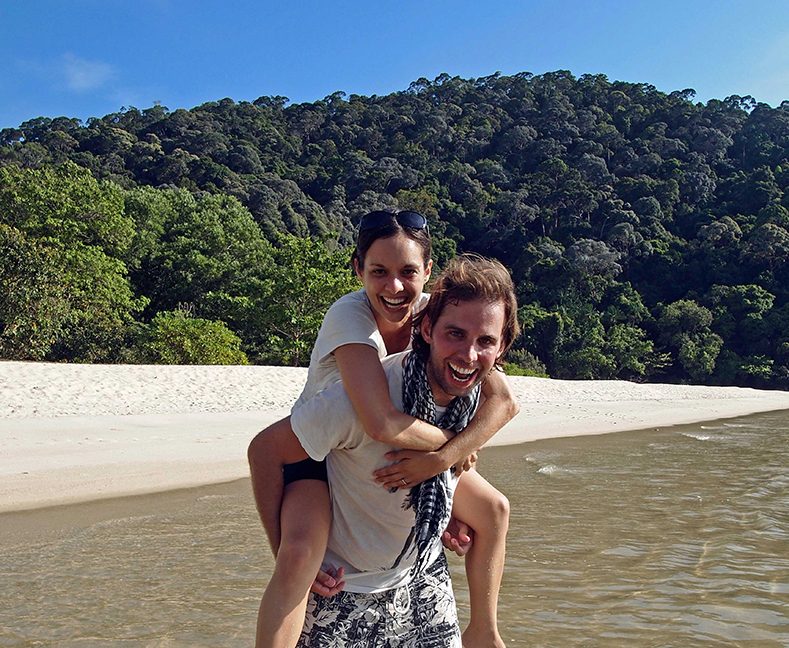 But, for us, this is our trip and we are doing what we both both enjoy. So, good for you that you are taking it slow and spending each day how you want to! Thanks! Maybe we’ll see you on the road. We tend to bump into other people RTW’ing and share stories. And if both of us are skipping the guidebooks there is probably a higher chance of that. Kudos on the second RTW. Any idea where you’ll land? 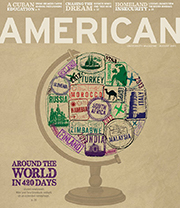 We will land in Asia, most likely Vietnam, Thailand, or Cambodia, but we are taking the long road there! Heading to Guatemala on Tuesday, and then south through Central and South America. Hope we will see you at some point, you never know! Mike: I hear you on the “choos(e) the first available outfit” front… Every time I go backpacking I quickly realize that I won’t need the extra clothes I brought. Except socks… Go socks! Tara: Ever used Yoga to appease the “where’s the gym?!? !” nerves? That’s my go-to workout when I’m traveling. Keep following your hearts. This blog easily earned an “insta-follow” from me! Totally agree on the internet!! Sometimes it’s impossibly frustrating to try and Skype or upload photos or download new music and it’s such a crap shoot if it’ll be good or not. Hope y’all are still enjoying Africa! We’re heading there on Sunday (Tanzania followed by South Africa). Cheers! This was a great post to read – it was nice getting to know you two a tad bit better. I just stumbled across this blog now. Thank you, Olivia! We love what you’re doing and wish you the best on your Asia adventure! Maybe we’ll see you out there.